Keith Wilson, a practising Jedi Knight from West Norfolk, has been forbidden from taking his ceremonial light sabre into school after his head teacher declared that possession of it violated the school's knife policy. The 14 year old student, who was born to Jedi Knight parents in 1995 and has been a practising Jedi Knight his entire life said that the decision was a great shock to him as carrying the weapon at all times was an important part of his faith. Before he could continue his mother entered the room and admonished him for his temper reminding him that anger leads to hate and hate leads to suffering and that was a key lesson of the verses of Episode 1. Jedi Knights are only allowed to take their light sabres onto planes provided they switch them off whilst the plane is moving. Meanwhile, the head teacher of Keith's school, Dennis Bock, defended his decision to ban the light sabre. �To begin with, I did not even know that he was bringing a light sabre to school,� Mr Bock explained, �He kept it hidden under his Jedi robes and everyone was ignorant of its presence. The trouble is that during a lunch break a couple of weeks ago Keith was involved in a dispute with some fellow students which resulted in him drawing his light sabre and leaping around the playground like Darth Maul. �The brandishing of the weapon was clearly a major concern to me, I have seen the entire Star Wars series dozens of time � they are the most powerful weapon in the universe, more powerful than a nuclear bomb or a death star, and most definitely more powerful than a photon torepedo � it would therefore be highly irresponsible of me to allow such a device into my school. And now the Year 11s know that he is carrying one � they will undoubtedly corner him in the toilets and flush his head down the toilet until he hands it over. �It is ridiculous,� One blogger commented, �Last week we had that Sikh guy wanting Sikhs to take the Kirpan, that Sikh knife thing, into schools, but they are still allowed to wear their turbans. 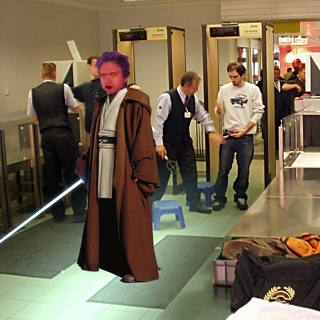 This week we have Jedis wanting to take light sabres in, but they are still allowed to wear their Jedi Knight robes. �They get to wear their outfits, but my kid isn't allowed to go to school in a loose fitting tracksuit with trainers and a big gold chain bought from Argos. He has to wear the 'school uniform' � and as soon as he puts his cellphone onto speaker mode to play his favourite tunes, he's called a 'chav' by his classmates and has it confiscated by the teacher.